A lovely citrine and diamond two stone ring create this unique piece of jewelry. Set in 14 carat white gold by the name you can trust in fine gemstones. This one of a kind piece of jewelry measures 6mm and has a total carat weight of 0.13. 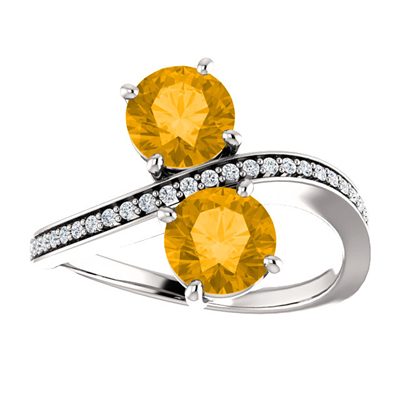 The trending citrine and diamond jewels creates a beautiful 14 carat white gold ring. We guarantee our "Only Us" Citrine and Diamond Two Stone Ring in 14K White Gold to be high quality, authentic jewelry, as described above.